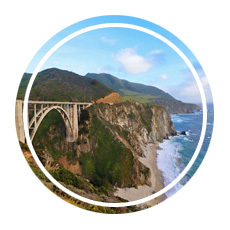 When a business trip took me to southern California for a few days, I couldn’t resist the opportunity to book a rental car, buy another plane ticket for Adam, and plan a vacation we have talked about for years: a California road trip. 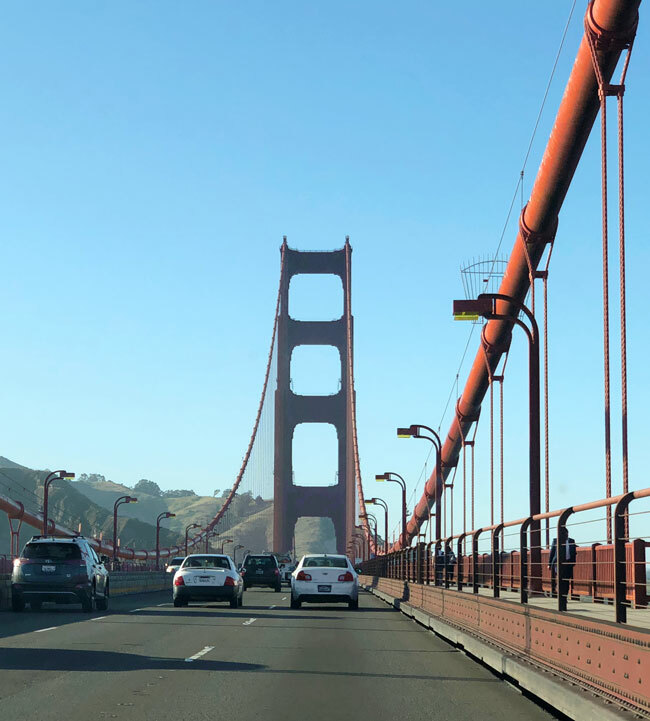 Although we spent quite a bit of time winding our way from winery to winery, our final destination was a city that is always close to my heart: San Francisco. 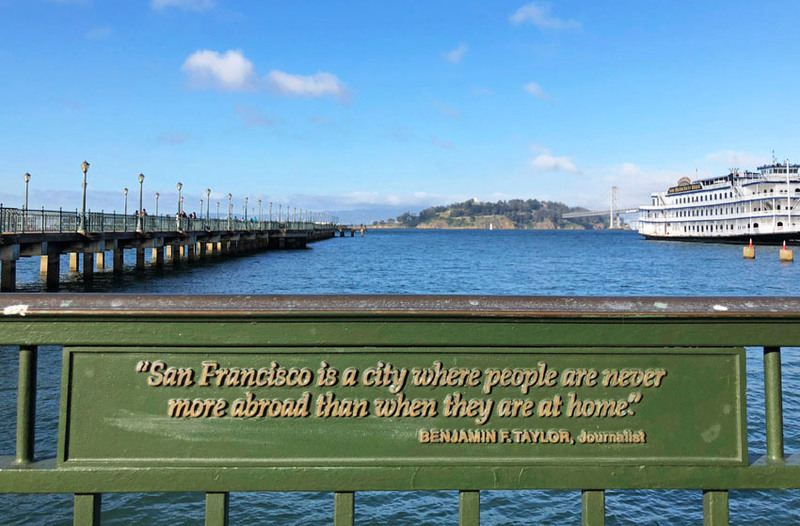 I was born in the Bay Area, and although I didn’t grow up there San Francisco has always felt a little bit like home to me. 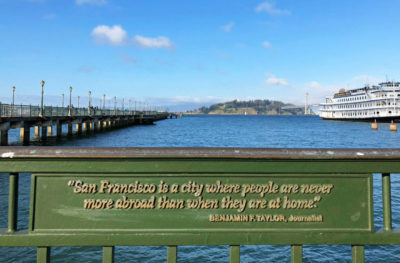 Today it’s a truly international city: in fact, I had to pause while walking along the wharf when Benjamin Taylor’s quote, captured on a plaque overlooking the bay, caught my eye: “San Francisco is a city where people are never more abroad than when they are at home.” It’s true, and it adds a certain character and magic to the city otherwise defined by steep hills, great food, and stunning landscapes and landmarks. As is usual for us, we had just a couple of days to enjoy the City by the Bay. 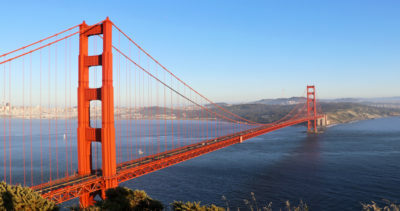 Whether you have two days or two weeks to explore, here are eight spots you can’t miss when visiting San Francisco, California. If you’re going to San Francisco, you won’t want to leave until you see the most iconic landmark in the city: the Golden Gate Bridge. 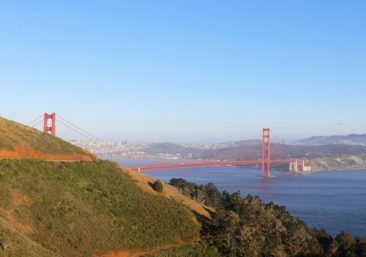 You’ll see it from many locations in the city, but the best place to appreciate its full span from the Bay to the Pacific Ocean is by visiting Vista Point and Battery Spencer. Located on the north side of the bridge, you’ll find two impressive vantage points for some amazing photos. Vista Point, closer to sea level, will give you the chance to get close to the bridge and take some photos looking through its towers. It’s an exceptionally popular spot for tourists, and although parking is free you may wait a while to find a space. There is a nice visitors center with restrooms and water fountains as well. On a clear day you’ll be treated to a nice look at the city skyline and Alcatraz. Our favorite spot was Battery Spencer, not far from Vista Point but at a higher point that allows for a more complete look at the bridge. We happened to visit at a time when the skies were clear and the sun was behind us, illuminating the orange paint and creating a vivid view that we struggled to pull ourselves from when it was time to move on. Parking is exceptionally limited; go early, go late, or take your chances, but know you will probably need to wait for a legal parking spot. We were frustrated with how crowded it was, but once we parked and made it to the viewing point we forgot about everything except enjoying the moment. 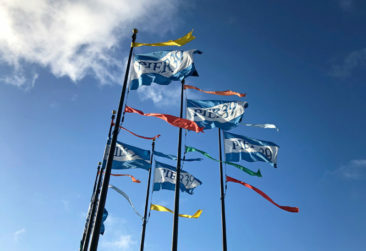 Save a few hours for a great walk around Pier 39, San Francisco’s Fisherman’s Wharf. One of the most popular spots in the city, especially for tourists, Fisherman’s Wharf has something for everyone. We found great restaurants, attractions including rides and museums, and plenty of shopping. 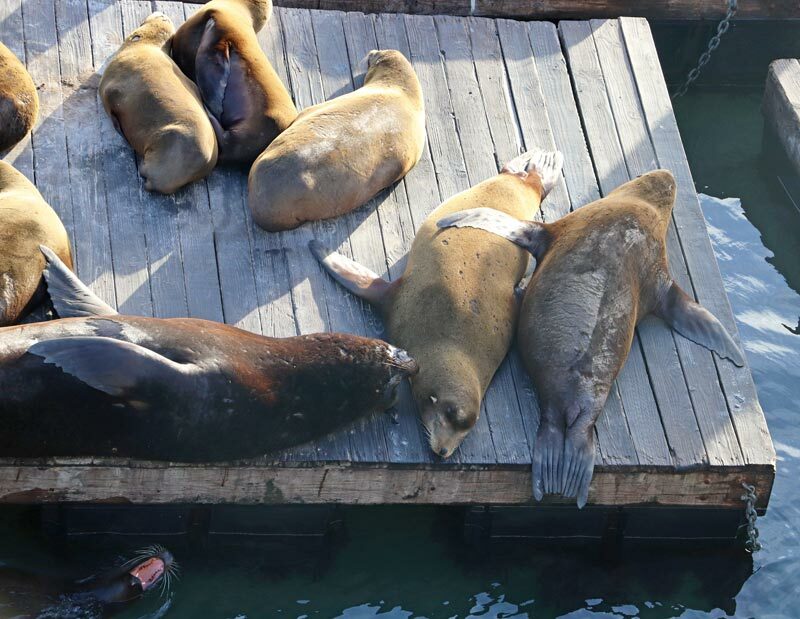 Of all the entertainment options to explore at Fisherman’s Wharf, our favorite was seeing the sea lions who took up residence on the K Dock in the late 1980s. Our visit came just before sunset, when the sea lions were waking up after a day of basking in the sunshine. 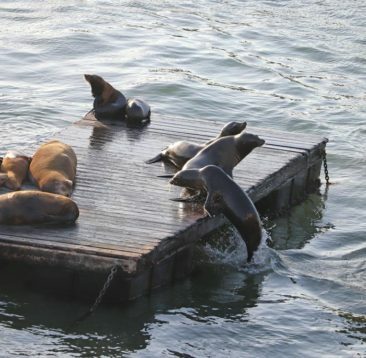 It was fun to see them start to stir, and many of them shuffled themselves from the docks into the cold water to refresh and play after hours of rest. Visiting the sea lions is free, although the Sea Lion Center also offers complimentary sessions to educate visitors about the local residents who call the pier home. Although you’re not likely to see the Tanner (or Fuller) families picnicking these days, the park at Alamo Square across the street from the Painted Ladies makes you feel like they might just show up. 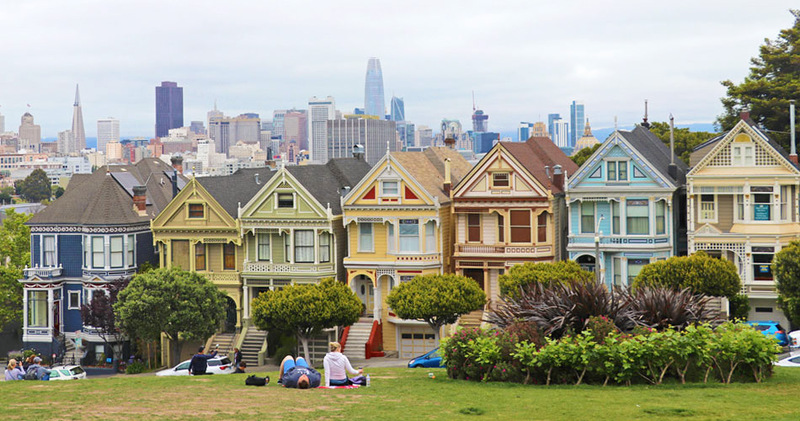 Anyone familiar with the TV show Full House or its spinoff Fuller House will recognize the beautiful Painted Ladies from the opening credits (Watch). Although you’ll find similar homes throughout the city, the most famous are the ones that form “Postcard Row” on Steiner Street. These gorgeous Victorian houses are a popular spot for photos. In addition to the impressive architecture, it’s equally striking to see the San Francisco skyline peeking out from behind them. Keep in mind you won’t see the front of the house used to represent the Tanner home; that house is located more than a mile away on Broderick Street. 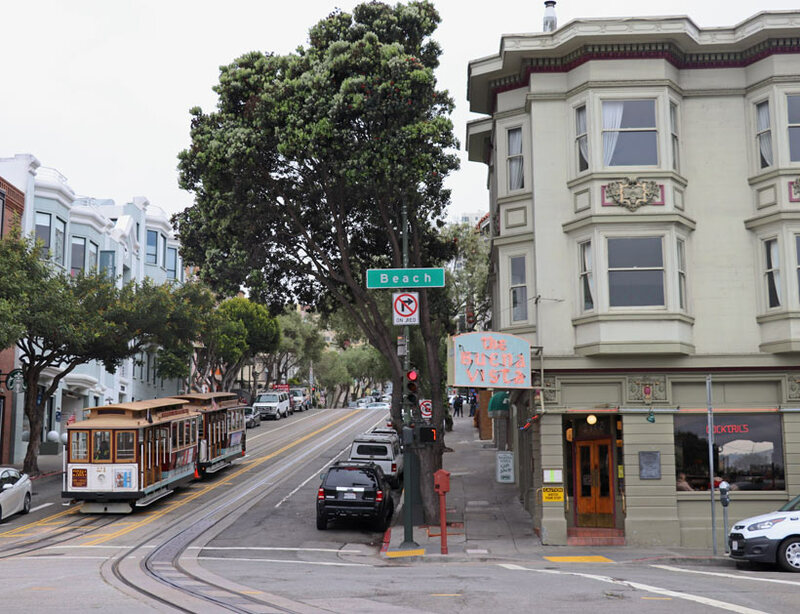 Parking was easy along Alamo Square’s perimeter when we visited, but remember that the neighborhood is more than a tourist attraction: it is a residential neighborhood. Be respectful of the people who call it home, and if you have to sing the Full House theme song (as I did), sing quietly! 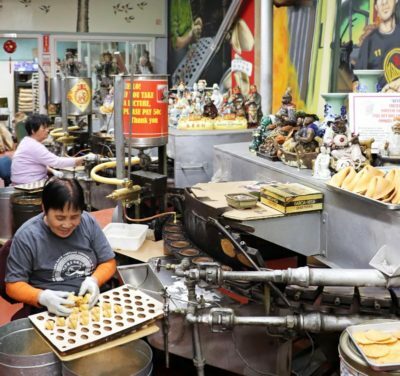 The fortune cookie hails from San Francisco, and the Golden Gate Fortune Cookie Company pays homage to its origins with an experience that is a definite tourist trap—and a worthy stop. The tiny storefront located off Ross Alley in Chinatown features smiling workers dutifully producing hundreds of delicate cookies. 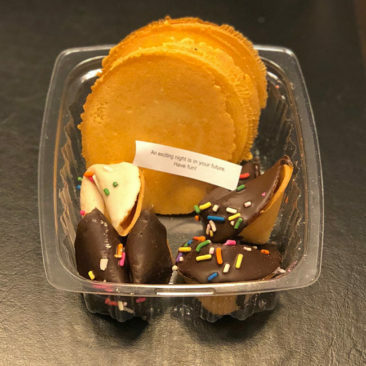 In addition to the cookies we know and love from Chinese takeout, the factory also sells flat cookies and cookies dipped in milk or white chocolate. The workers are happy to have their picture taken, but it costs 50 cents USD. Roll the cost of the photo into the purchase of some fortune cookies; it’s a great investment. 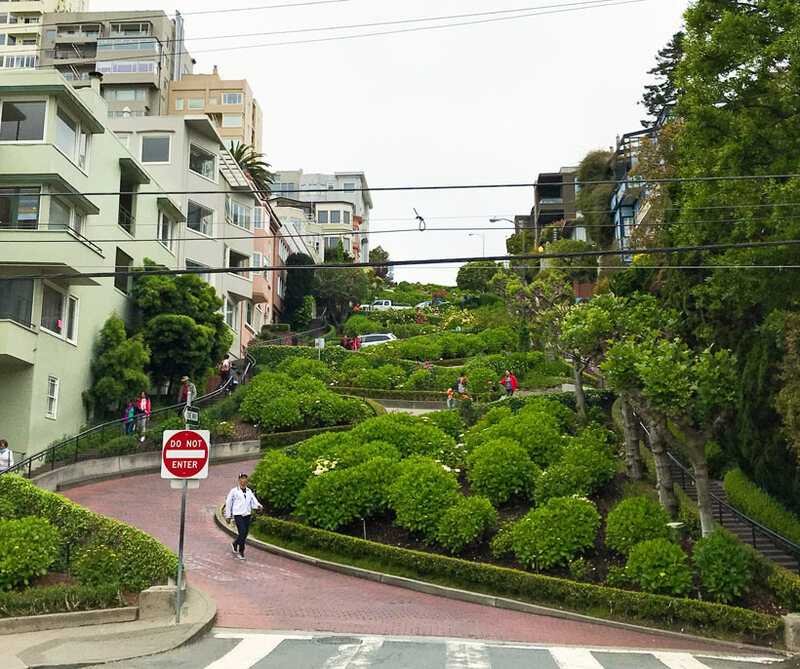 Driving in San Francisco is challenging, but no single block is more complicated—or picturesque—than Lombard Street. Affectionately referred to as the “Crookedest Street in the World,” Lombard Street has no fewer than eight hairpin turns that were designed to help cars navigate a hill that would otherwise overwhelm most automobiles. We stood at the bottom of the hill and looked up toward Hyde Street to admire both the green gardens that decorate it and the fearless drivers who somehow pilot the sharp turns to arrive safely on Leavenworth Street. Whether or not you want to try your hand at driving down the hill, it’s worth visiting for some great pictures. 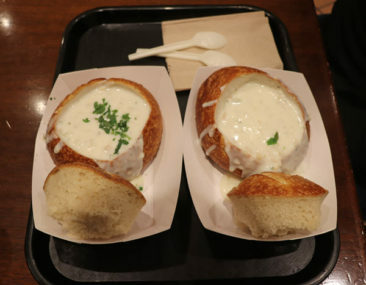 San Francisco is no place to cut back on carbs; the city is famous for sourdough bread, and a cold, foggy day by the bay calls for clam chowder in a sourdough bread bowl. We stopped into Boudin Bakery and savored every bite of creamy soup and crusty bread. Boudin Bakery takes credit for creating sourdough, and the bread they serve today is made from the same sourdough starter they have used for almost 200 years. 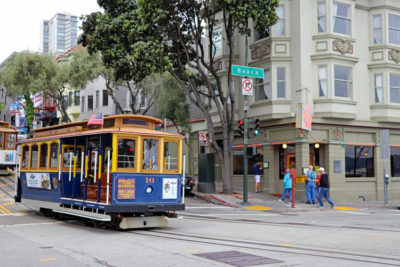 In fact, they are San Francisco’s longest operating business. You’ll find great sourdough throughout the city, but for 10 USD it’s worth it to try the original. 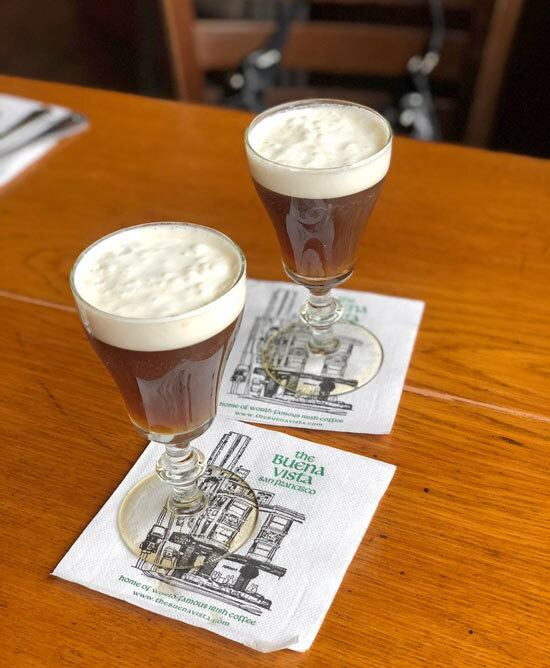 You might not visit San Francisco for an Irish coffee, but you should—and you should be sure it’s from the Buena Vista Café. Although the Irish coffee was not invited in the USA, the owner of the Buena Vista Café is credited with perfecting the recipe that is based on a coffee served in Ireland and is still prepared the same way to this day. The coffee is warm, strong, and resembles a tiny pint of Guinness. Pair your Irish coffee with something from the menu; their breakfasts are delicious and filling. Arrive close to opening time if you can, as tables go quickly and space is a bit limited. 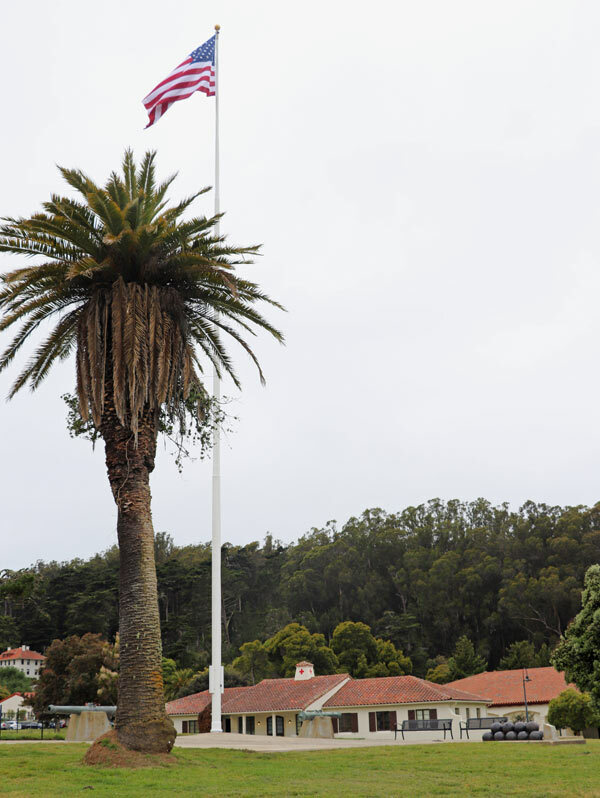 San Francisco’s Presidio is a great stop for history lovers. Dating back to 1776, the Presidio was established as an outpost of Spain’s New World colonies before it became a military post. San Francisco built up outside of its original walls. Today, the original northwest marker stands in place as what is likely the oldest portion of the city. 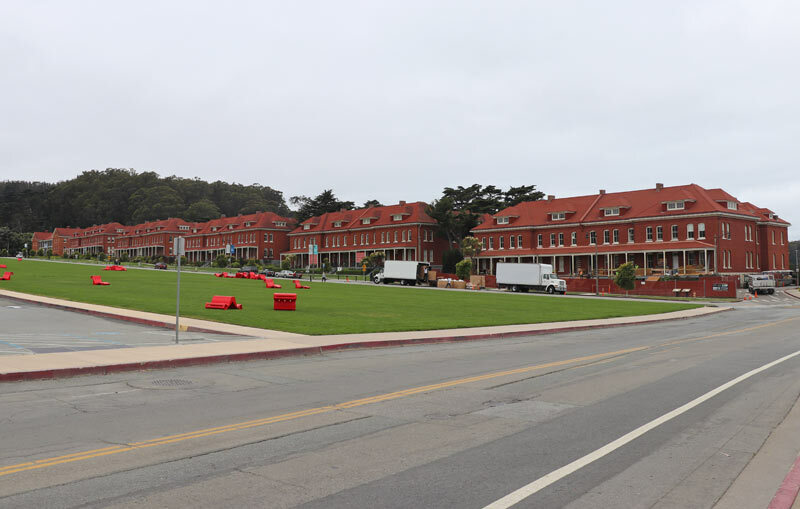 Visiting the Presidio’s Main Post could take hours on its own. 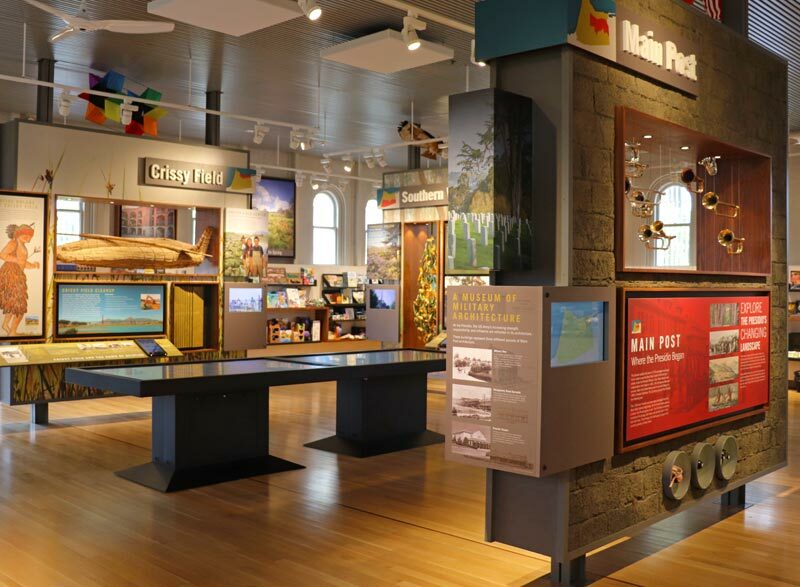 Start by orienting yourself at the visitor’s center, and then make your way to the Officers’ Club for an in-depth look at the post’s history. 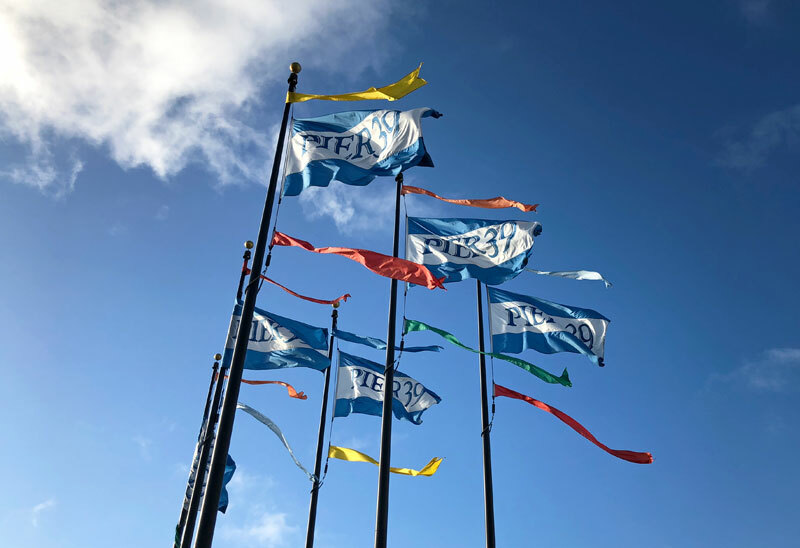 Museums including the Letterman Digital Arts Center and the Walt Disney Family Museum might be worth extending your visit to see, and a few more eclectic stops—including a pet cemetery—might grab your attention as well. Crissy Field is a great place for some views of the Golden Gate Bridge and Alcatraz. This is an acoustic structure activated by waves that crash into it to create lovely music. 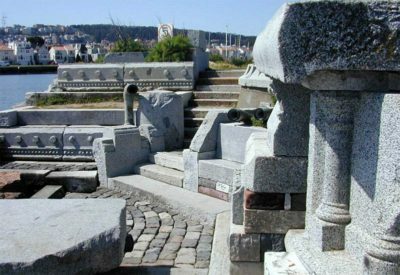 The Wave Organ is a fun place to bring the family for an afternoon by the bay. Home to the world-famous former prison and the oldest operating lighthouse on the USA’s west coast. Alcatraz is one of the most popular tourist attractions in San Francisco. A once secret path that is now known as a great spot for walking and beautiful views of the Golden Gate Bridge. The trail takes some time, but the view at the end is worth the trek- especially the famous “Hidden Labyrinth” rock formation. Everyone loves a chocolate factory, right? This is where the Ghirardelli chocolate company houses its headquarters (and, of course, sells delicious treats). San Francisco is a great walking city, but many of the hills will test your cardiovascular system! 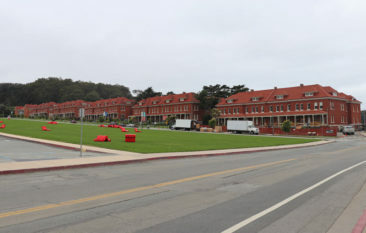 Although areas including the Presidio and Fisherman’s Wharf are easy walks for most travelers, other parts of the city may involve some difficult-to-manage hills. Take the hills slowly, or consider using public transportation or ride services to get from place to place. 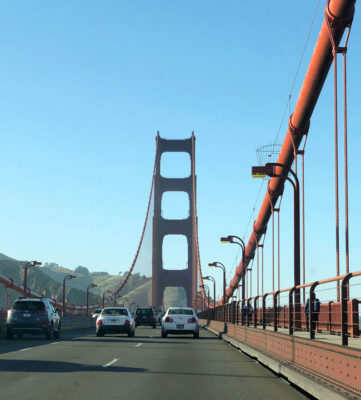 There is no toll for cars headed northbound on the Golden Gate Bridge, so if you want to drive across and skip the toll start in the city and drive north toward Sausalito. The toll in the opposite direction will be 7 USD in July 2018 and cannot be paid in cash; electronic tolling or pay-by-plate tolling are the only options available, which may be inconvenient if you have a rental car. 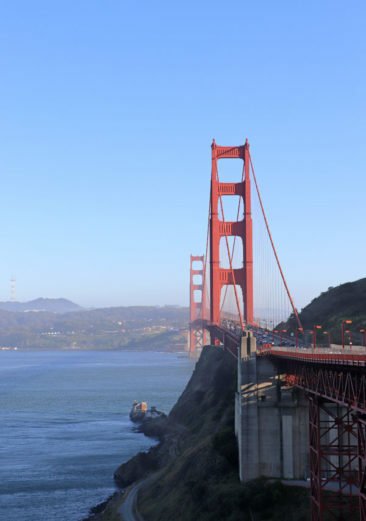 Save yourself the hassle and enjoy the drive on the way to the Vista Point and Battery Spencer, both of which are located north of San Francisco. 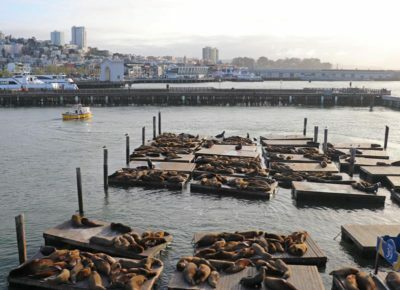 Because San Francisco is a popular destination for visitors from around the globe, activities fill up fast. If you want to visit spots like Alcatraz, purchase your tickets as far in advance as possible to be sure you don’t miss out. If you can, avoid renting a car and explore San Francisco by public transportation or by foot. Parking is very expensive, and you may waste a lot of money if you park daily—not to mention a lot of time if you have to seek out new spots. Parking at hotels can cost more than 60 USD per night, which can really add to your hotel bill. 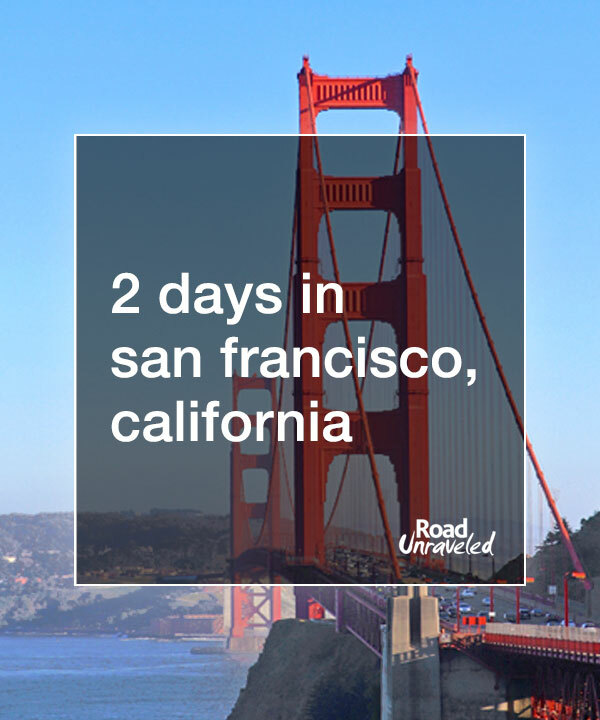 San Francisco has lots of fun, interesting, and eclectic neighborhoods, and if you have more than a couple of days don’t miss the chance to explore a few of them. Telegraph Hill, the Mission District, Chinatown, and the Castro are all great options to research and consider if you are looking for a less “touristy” experience. We had a great stay at the Courtyard by Marriott San Francisco. Conveniently located near Union Square and Chinatown, we walked from the hotel all the way to Pier 39 on our first day in the city without any trouble at all. The hotel was comfortable, clean, and had a great bed and wonderful shower. 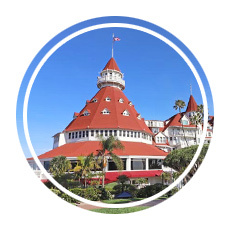 We also loved how friendly the staff was; they were constantly smiling and made the check-in and check-out process fast and easy. 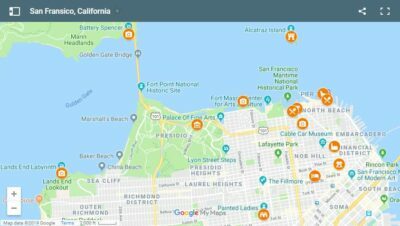 If you are planning your trip to San Francisco, this map will help you get an idea of where some of our favorite spots are located so you can put together an itinerary that will work for you! 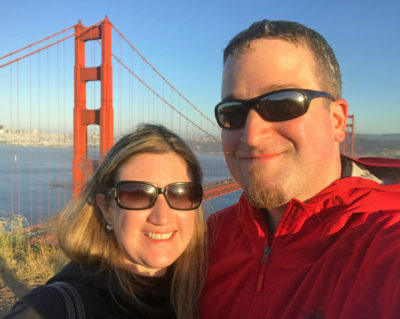 We loved our quick visit to San Francisco, California. We experienced a little bit of everything: gray skies, sunny skies, wind, warmth, rain, and plenty of great sightseeing, activities, and food. If your journeys take you to the state of California, San Francisco is an incredible city to discover along the way. 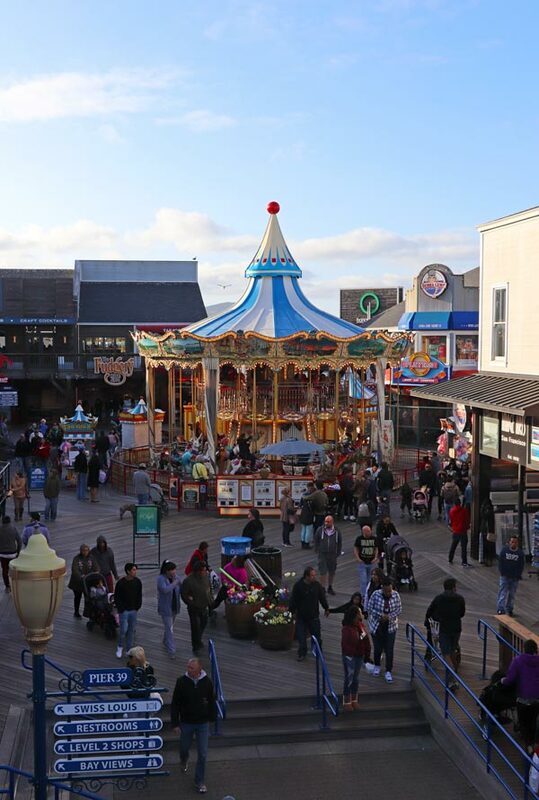 Leave a comment below and let us know what you love about your time in the city—and what we should add to our list for our next trip! Here are some more photos from our brief trip to San Francisco. 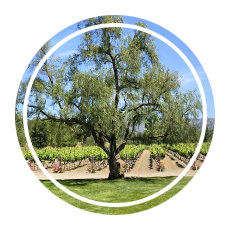 Planning a trip to California? 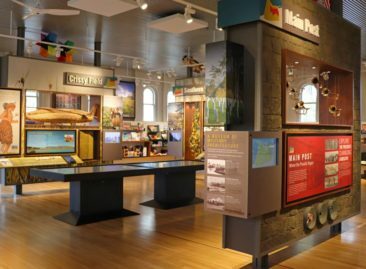 Here are some more fun places to visit around the state!